I’ve tried stamping with duochromes before and the very nature of the polish tends to work against it. Duo/multichrome needs to be a bit thin to create the depth and range of color that you see across the curvature of your nail. So it’s hard to get them to show up when you stamp. And regular polishes dry quickly, which means there’s little room for error. 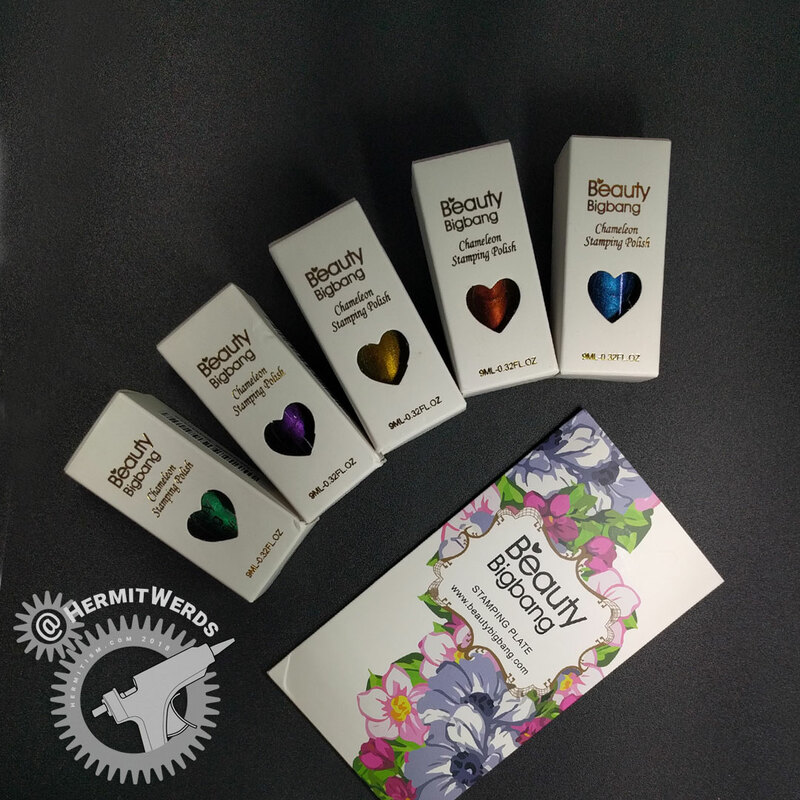 So how did Beauty BigBang’s polishes work for me? In comparison to photos I’ve seen of Moonflower’s duochromes, the J6504TM polishes have more color shift but are less opaque. Painted directly onto the nail they were quite patchy on my natural nails with nothing underneath and applied terribly over white gel polish. I’ve had similar problems with white bases and shimmery polishes before so I suspect it’s just a bad match. 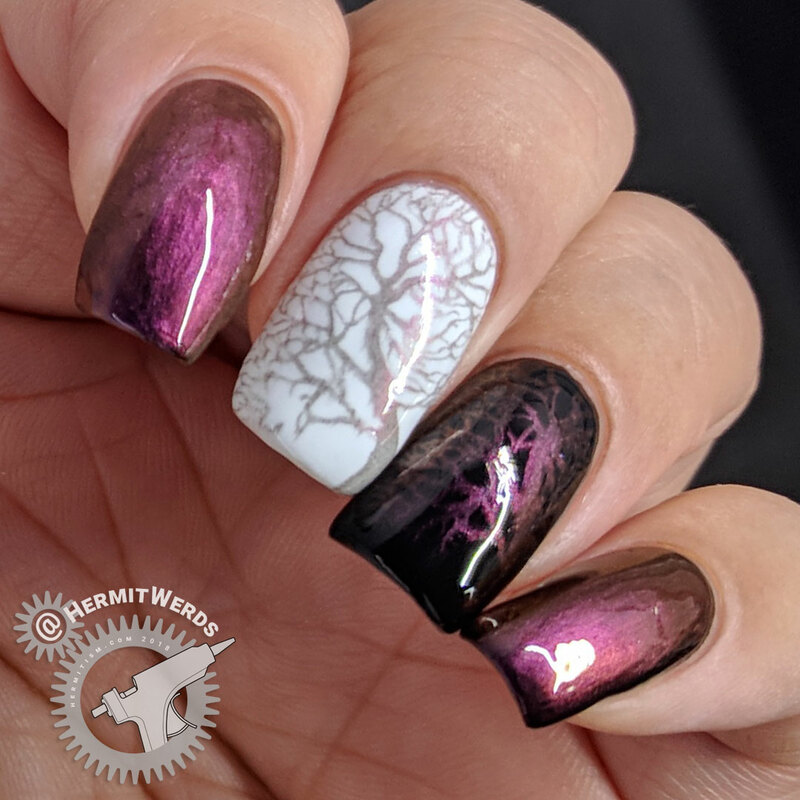 My recommendation is to either go dark or pick the color you want most emphasized in the polish’s shift spectrum and use a polish with that color as your base for “easy” full nail coverage. I certainly plan on playing with the possibilities in that more (as you will be able to see in tomorrow’s post). Since this is my first time reviewing a Beauty BigBang polish, here’s a photo of the brush. It’s fairly wide and flattened down with a little curve at the end as it spreads out. I think if you had very narrow nails it would be hard to paint without hitting the sides, but my nails are wide so I had no problems. As far as stamping goes, the formula is a tiny bit thicker than most regular polishes and slower to dry. I misplaced my scraper once and was still able to get great pickup. This is a polish, however, where I’d recommend painting over the whole image instead of hoping your scrape will fill the lines at the bottom. It gives your stamp a tiny bit more color and every bit counts. 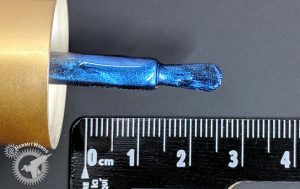 Stamped over white, the color will appear grey at some angles, a problem that Moonflower polishes didn’t appear to have. 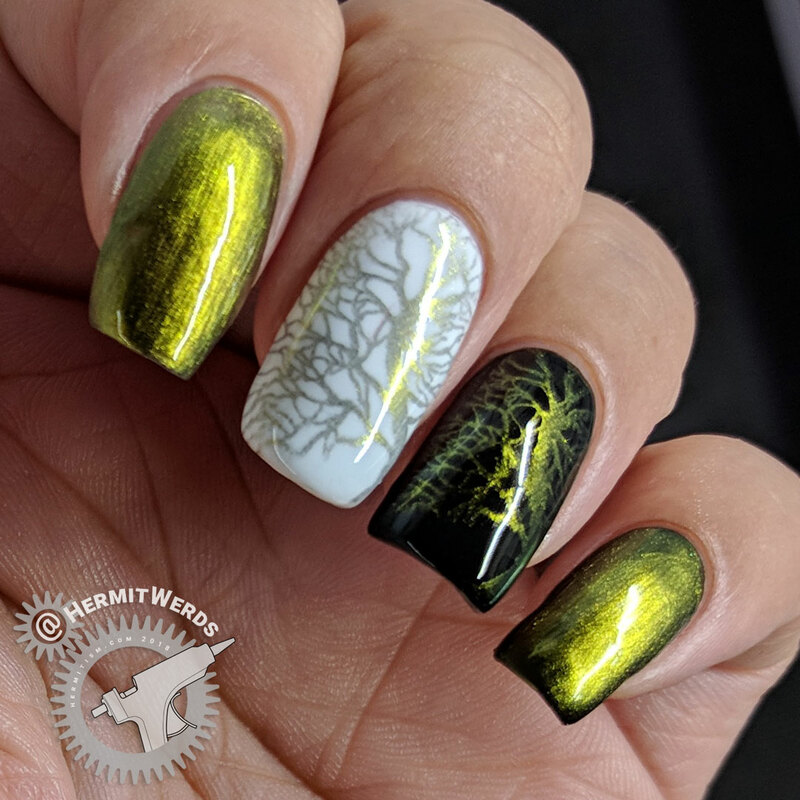 Stamped over black, they are subtly colorful. Finally, watch out for top coat draaag. Since they dry more slowly, it is very easy to destroy your work by applying top coat too quickly as you can see with my swatches. Making mistakes for you, right? 😉 I use Seche Vite, which does have a reputation for betraying drag. Possibly some of the newer smudge proof top coats won’t have this problem. Overall, I’d say the polish with the most shift is J6504TM-1A. The least shifty polish is J6504TM-2A. 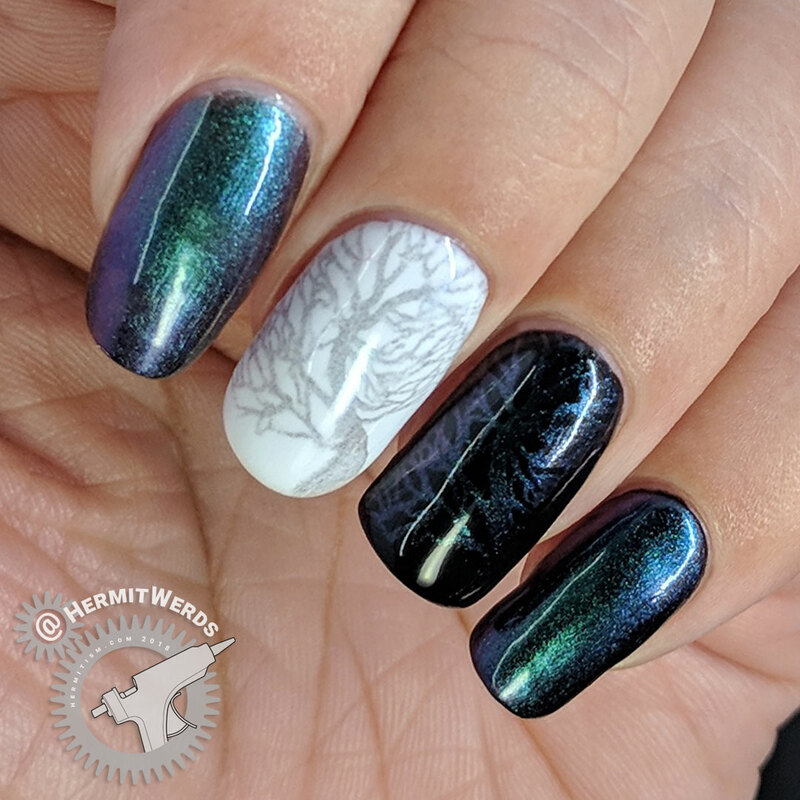 Originally I’d meant to only use three of the set on this design and use the rest in the next nail art, but the rainbow was so pretty. I found myself using them all and they blend so well together. Whatever I feel about the amount of shift in each individual polish together they are very strong. And that’s something to consider when working with a budget. 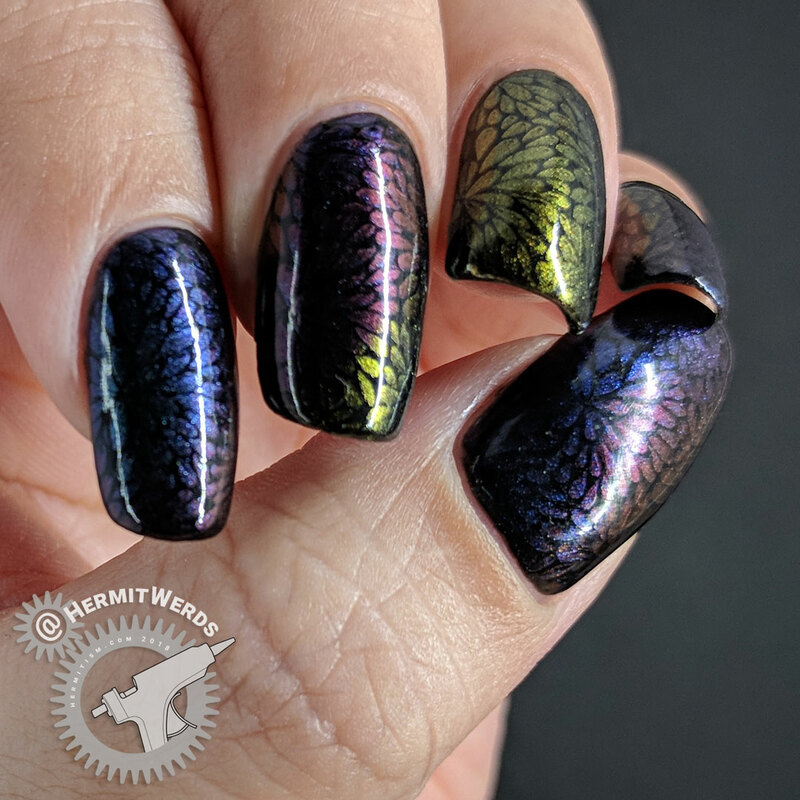 A gradient with several duochromes will give much more shifty results than one really shifty polish. And so far I’ve found the most shifty polishes tend to have the same pink/green as the main colors. 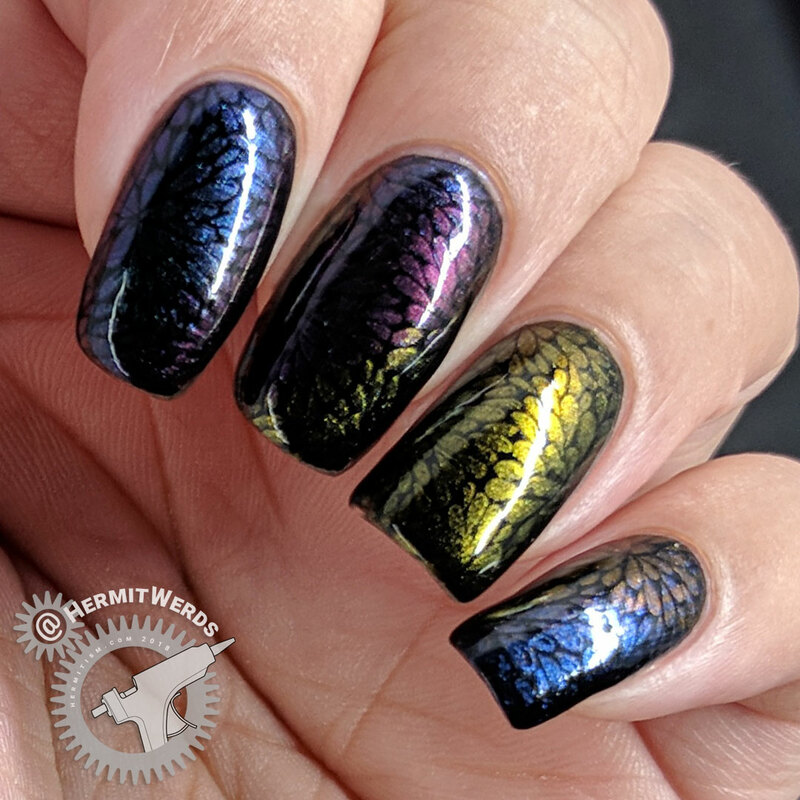 So as far as versatility goes, whether or not this is the set you want, my rainbow heart is leaning towards combining duochromes instead of trying to find the one true multichrome in the colors of your choice. Reusable black gel polish base. While I really hoped they would be more opaque, I see a lot of uses for this set and I’m hoping all the polishes will be in regular rotation. 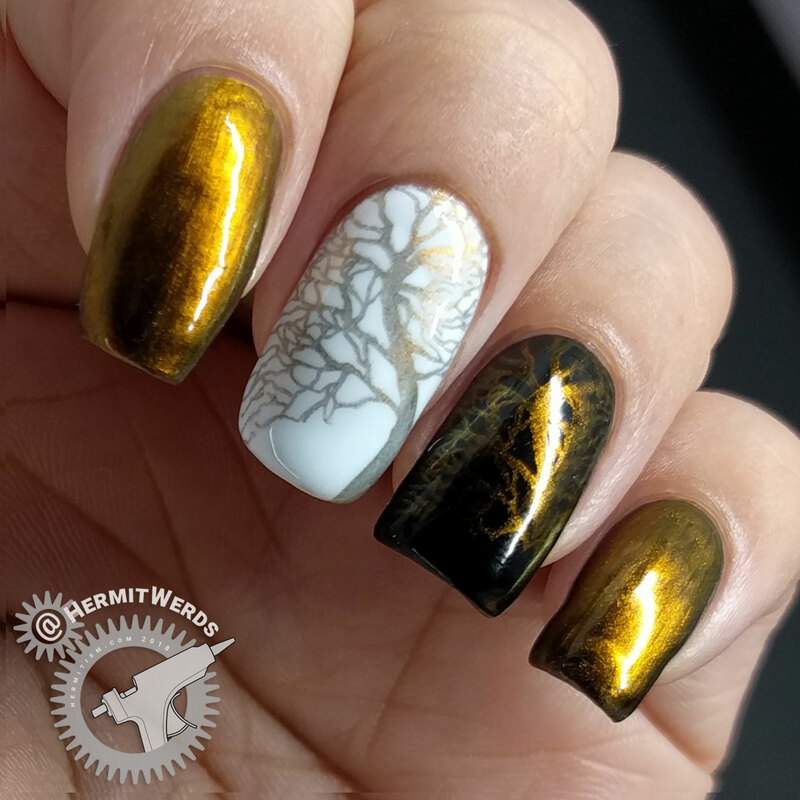 I will likely use them most as flat colors and accent stamping to support an image on top, but my nail art style tends to be many-layered. Stamped as pure pattern I think you can see how gorgeous they are. 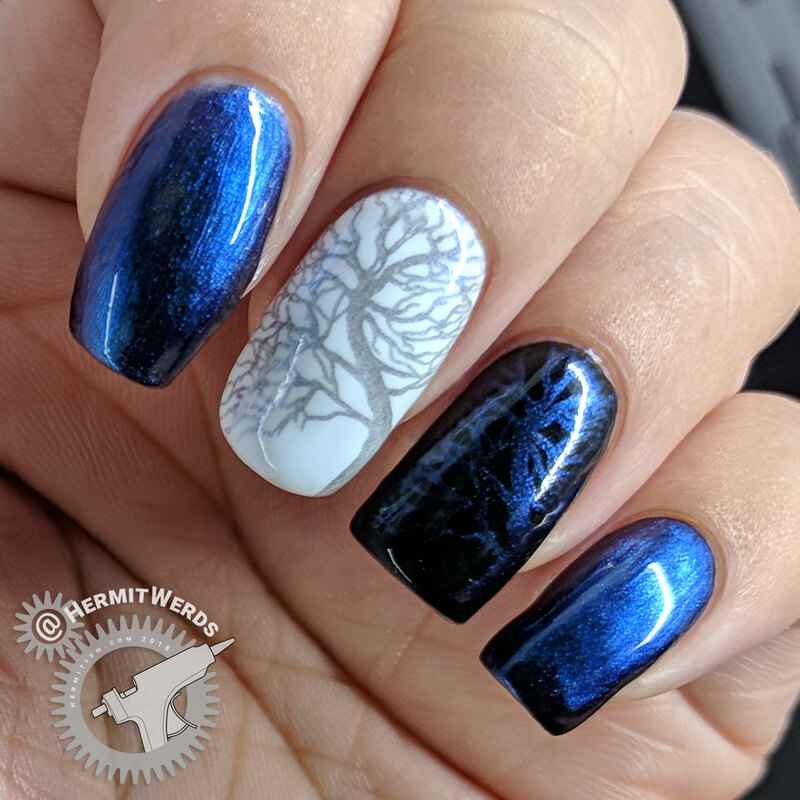 They also work great when used to fill in a decal, which you will see tomorrow along with a review for the stamping plate I used in all the swatches. 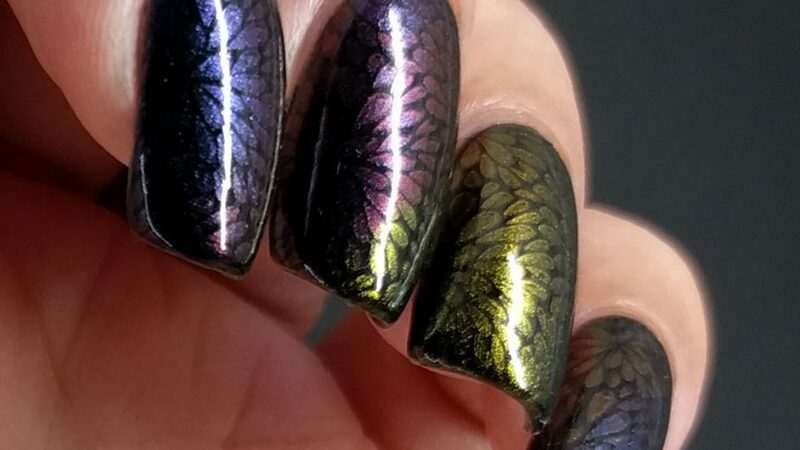 If you’re interested in this set of duochrome stamping polishes (J6504TM) (or the individual colors J6504TM-1A, J6504TM-2A, J6504TM-3A, J6504TM-4A, and J6504TM-5A) feel free to use my discount code (hermi) for 10% off your order. (Non-affiliate code). Thanks again for sending these to me, Maggie!